Massey Harris Hay Loader, believed to be from the 1950's. Located at the Osprey Museum in Rob Roy. 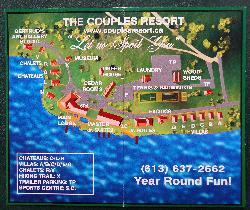 A photo of the facilities site map of the Couples Resort in Whitney Ontario, just on the edge of Algonquin Park. 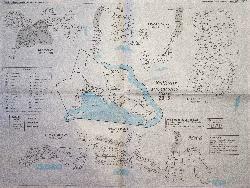 Shows the location of all the cabins and recreational areas. 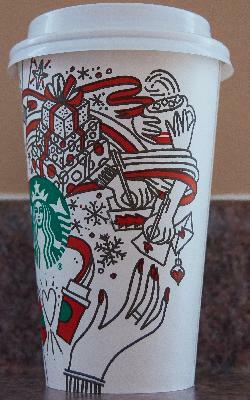 The right side of the starbucks medium coffee cup celebrating Christmas in 2017. Purchased in Ontario. Contains various artistic drawings of Christmas related activites. This is the 2013 site map for the Killbear Provincial Park. Taken from the park visitor guide. Includes all camp sites. Site numbers can be seen when zoomed in. The Osprey Museum in Rob Roy. This historic building was previously a school house. Photo taken while driving by the museum. 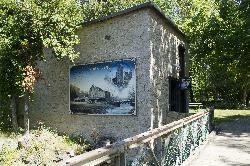 Sketch posted at the Inglis Falls Conservation Area showing how the Inglis Grist Mill may have looked. 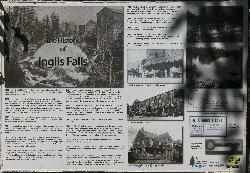 Photo of a posting at the Inglis Falls Conservation Area. Shows the history from 1842 to 1960. Located near Owen Sound Ontario. from site: The Municipality of Grey Highlands is situated in one of the most beautiful parts of Grey County. Made up of the former Townships of Artemesia, Euphrasia, Osprey and the Villages of Markdale and Flesherton. We proudly boast the natural beauty of waterfalls, the Bruce Trail, the Osprey Bluffs and the Saugeen and Beaver Rivers and encompass the "heart of the Beaver Valley" truly making Grey Highlands the place for all seasons. from site:Detailed records including group photos from all of Osprey 1 room school houses. Settlers early tools and farm machinery. Settlers household items. Many unique collections.